Wood River High School graduate Houston Shaw has only been shooting competitively for four months, but shooting must be in his blood. He placed third in his division in the 2011 Steel Challenge World Speed Shooting Championships in August, beating some of the world's best shooters. Shaw, 23, placed third in the "production" category, a division in which a shooter uses an unmodified gun to shoot five steel targets over an eight-stage course. Competitors must begin by holding their hands above their shoulders, drawing and shooting at the sound of a buzzer. "It was my first huge, huge competition," Shaw said. Though he's competed in national competitions before, this was only his third competitive match. Consistency is the trickiest part, he said, and he has to be careful not to let other, faster shooters throw him off his game. "When you hear these guys shooting that fast, it's hard to drop it down a gear," he said. "You're hearing this guy's cadence and you pick it up. But the thing is that because they are so fast, when they have a bad run, the wheels completely fall off. I know if I'm consistent, I'll place in the top five." Shaw is the son of Hailey native John Shaw, who also competed and who has been wielding pistols competitively for decades. Shaw himself has only been shooting heavily for about a year, and competing for four months, but said his father's influence gave him a leg up on the competition. "Shooting is a way of life for my dad," Shaw said. "All he does is shoot. In the 1980s, he dominated shooting in the United States." John Shaw is a self-taught shooter who began shooting in 1979 and has placed in or won nearly every major shooting competition in the world, including World Speed Shooting Championships and the International Practical Shooting Confederation competitions. John Shaw was also a nine-year member of the World Champion U.S. International Practical Shooting Confederation team. As a result, Shaw grew up shooting, but mainly recreationally, going on duck hunts with his father. Shaw said he shot frequently when going to school at Wood River High School, going with his friends to collect targets for practice. "We'd go behind a bar and get a bunch of beer bottles, put them up and shoot them," Shaw said. The Shaw family owns and operates a training facility in Memphis, the Mid-South Institute of Self-defense Shooting, which serves as a training spot for special ops and military forces. 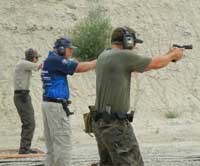 Since graduating from the University of Reno in Nevada last year, Shaw has been an instructor at the range, and lately has fallen into competition—and trying to keep up with his father. However, he said, because his father is also his coach, having him there helps Shaw in competition more than it hurts him. "I don't think of it as me beating him or him beating me—he just keeps me in line," Shaw said. "All I keep thinking is, 'I just have to keep up with him and I'll be fine.'" Shaw's mother, Beverly, said she wasn't surprised that he did so well despite his relative inexperience. "If he sets his mind to something, he usually can do it," she said. "If he didn't think he could do really well, he wouldn't have done it." Shaw has two competition guns, one modified for speed, but the one he prefers is an unmodified Sig Sauer P226 X-5 Allround. Using the production gun makes it difficult to compete in the "limited" division against shooters with faster modified pistols, he said, as a shooter can expect to be 10 to 15 percent faster with a modified gun. "You can do a lot of work on guns," Shaw said. "In the high-speed division, you can do a lot, you can cut away metal and make the gun work better. So everyone had these high-speed guns, and I was using my Sig." Despite the challenges, Shaw said this was far from his final competition. Competitive shooting favors younger participants, he said, because younger shooters have sharper eyes that give them an advantage over some of the veterans. "I've got a few more years of this before I peak," he joked. "I'm not sure what my next competition will be, but I'll definitely do it again. That's all I do is shoot."